A Journey With A Purpose. . .
Posted on April 11, 2014 by helensamia under Health, Other things! I wonder if in the future Artificial Lymph nodes could be created….. Imagine the possibilities that could open up for the treatment of all types of Lymphoedema…it is good to see that research is being done in this area…. “The lymphatic research group is part of the biological sciences platform and the Brain Sciences Research Program at Sunnybrook Research Institute (SRI). Our principal investigator, Dr. Miles Johnston, has studied the lymphatic circulatory system for over 30 years. The role of lymphatic injury in the generation of post-surgical lymphedema in breast cancer. We are fully affiliated with the University of Toronto. The loss of the lymph nodes in cancer patients may have a much more negative impact on tissue fluid balance than has been considered in the past. 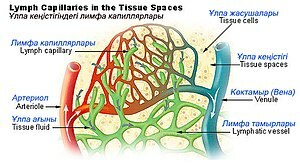 Available evidence suggests that the absorption of protein-free water into the capillaries of the nodes has an important role in the regulation of pressure and volume in downstream anatomical elements of the lymphatic system. The autologous transplantation of lymph nodes into the surgical resection site could facilitate the restoration of normal lymph transport in the affected limb. However, the removal of a normal lymph node could lead to donor site morbidity. We are investigating the possibility of developing an artificial lymph node that could be implanted into the surgical resection site. We are attempting to create an implant that will stimulate new blood vessel and lymphatic vessel growth resulting in the recreation of an intact lymphatic network.